Buckeye Valley’s Rylee George fires to first base after fielding a bunt by Orange’s Tristan Hatfield during Monday’s non-league showdown in Lewis Center. LEWIS CENTER – Buckeye Valley softball coach Mindy Eisnaugle has been telling her team to compete for seven innings. The Barons took the first-year coach’s instructions to heart and exploded for eight runs in the sixth inning to break a 2-2 tie and run away with a 12-2 win at Olentangy Orange in non-league action Monday night. Eisnaugle and the Barons worked short-handed last week, missing key players Olivia Schick, Cora Hollingsworth and Lexi Richardson among others. With spring break in the rear-view mirror, Eisnaugle had most of her team back. Schick was solid in her first outing back after spending the break on a cruise. The Ohio Dominican commit tossed a complete game and allowed two runs on seven hits and three walks. She struck out five to get the win. Two runs scored off a ball Schick sent deep that the Pioneer right fielder just couldn’t track down to break a 2-2 tie with one out in the seventh. 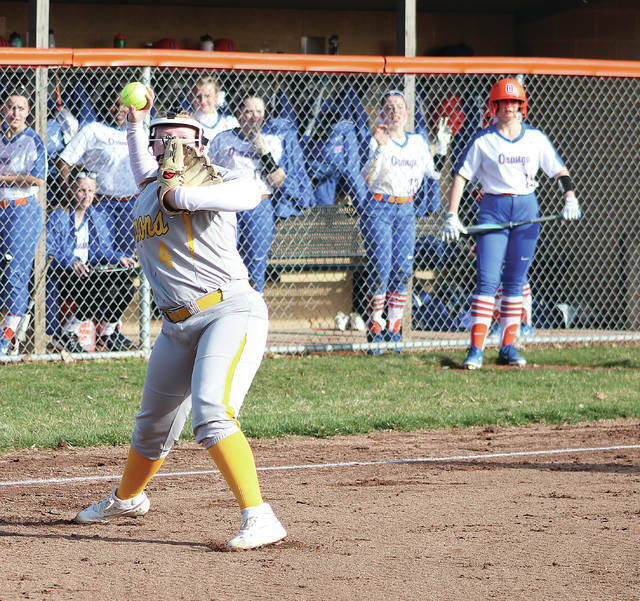 Hollingsworth, who was cleared to play prior to Monday’s game after suffering an injury to her rotator cuff, lined a double to left to drive Schick home. Two errors produced a couple of runs and Rylee George capped the rally with a two-run double to make it 10-2. Anika Craft and Nina Peak had three hits apiece to lead the BV offense. Craft scored four runs and George and Ashlea Kehl each drove in a pair for the Barons (2-4). BV played three games short-handed last week, including a pair of league games. Orange was off for the week because of spring break. Brenna Oliver was solid until the sixth. She set the side down in order in the second and fifth innings and faced the minimum in the fourth and even retired the first batter to open the sixth. Then, BV got hot. All told, Oliver gave up five runs, three earned, on eight hits and struck out five, but took the loss for the Pioneers (1-1). She also had a pair of doubles, the first of which led to a run. Teresa Hawk had two hits as well, and scored a run on a Morgan Powell single to tie the game 2-2 in the third. Next up, BV returns to MOAC play today when it hosts Clear Fork at 5:15 p.m. Orange hosts Big Walnut in non-league play Wednesday at 5:15 p.m.